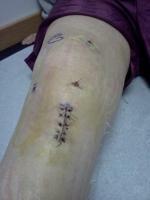 Why is my knee poping after having ACL recontructive surgery 2 years ago. Sometimes it pops in the morning real loud my wife can even hear it. I does get a little sore sometimes. It does give me a little discomfort sometimes but i do take medicine for the discomfort.